Our mission is simple – to work with Indigenous artisans and performers to promote their incredible contributions to our world. We welcome you to join us as we enrich cultural understanding and diversity through workshops, events and festivals. We are based in New Mexico, the Land of Enchantment, and have been creating unique cultural experiences since 1994 – from intimate artisan gatherings to multi-day festivals with international participation. We’ve worked on every continent (except Antarctica!) from the deserts of New Mexico to the steppes of Mongolia, from the Arctic Circle to southern Chile. We have long-standing relationships with some of the best Indigenous artists and performers, chefs, fashion designers, and Indigenous organizations around the world. Do you enjoy learning and seeking out new cuisines and experiences? Then we think you’ll want to know about (and join) our events! Are you a performer or artist? Through workshops and promotions, we help Indigenous artists, food producers, and chefs build markets in the U.S. and internationally. We love working with talented people to turn their ideas into opportunities for them to thrive. (And we’ve been told we’re fun to work with as well.) And, if you’re just now in the idea stage, we’d be happy to spend a few minutes of brain sharing, based on our years of experience. 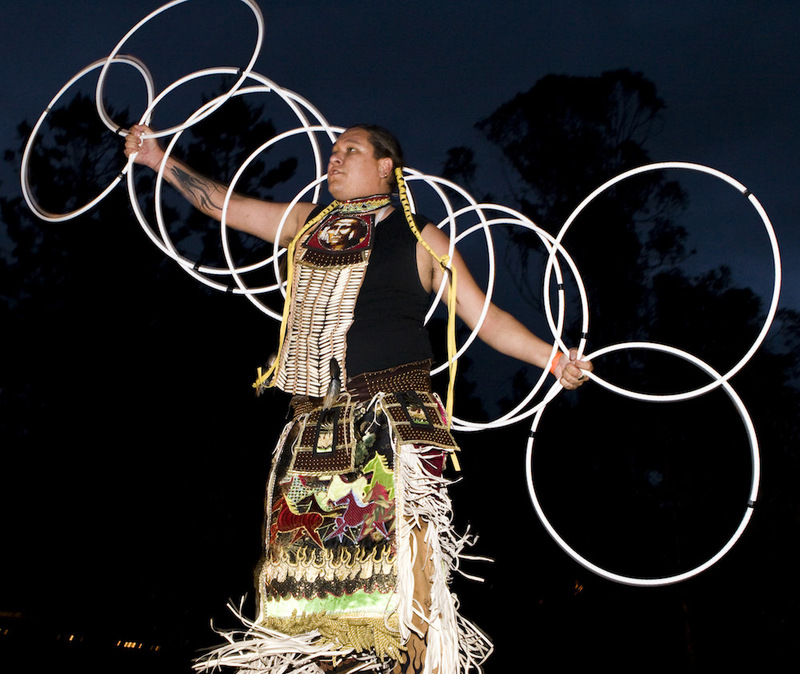 We’ll work with you to design almost any kind of Indigenous event (traditional or contemporary) from anywhere in the world for a truly unique experience! And, we’re used to working with all sizes of budgets and on tight schedules. We’re always happy to share ideas (no strings attached) and do a bit of brainstorming. So, even if you’re just in the “thinking about it stage” we’d love to hear from you. Promoting peace through cultural experiences. Please join our email list to learn more as we plan more events! We’ll be posting more information here as plans develop. I am writing to thank you for your assistance and initiative with the visit to Russia of Andrew Thomas, an outstanding representative and cultural ambassador of Navajo Nation. During his visit to Russia on April 3-11, 2014, he gave performances in Ussuriysk, Luchegorsk, Yuzhno-Sakhalinsk, and Nogliki to about 1000 people. Andrew’s energy, talent and skillful performances showed the best of American culture to the Russian audience, significantly contributing to strengthened cultural ties between Russia and the United States of America. Over the past four years, we have had the pleasure of working with Bronitsky and Associates to bring distinguished presenters to the Institute on three occasions… Each of these presentations was superb, both in terms of the important topics on which they spoke and their authority to do so. … The audience response – particularly from students – to these presentations was tremendous … I count us fortunate in having established a working relationship with Bronitsky and Associates because it has allowed us access to excellent speakers about whom we would otherwise not know. Gordon Bronitsky has been associated with the Western Australian Department of Culture and the Arts (DCA) since 2003, when he attended the Indigenous Arts Showcase in Perth as a delegate and presenter. … His knowledge and experience was appreciated by all who attended. … Gordon has provided numerous opportunities for Indigenous Western Australian performers to tour the US, and other countries… In late 2011, Gordon travelled back to Perth … where he once again demonstrated a strong commitment to promoting WA talent. … Gordon’s enthusiasm to broker relationships – both cultural and economic, between our two countries should be applauded. We thought we would share with you some of the excellent press coverage we received from her big performance last Tuesday. She also did a lengthy TV interview last night. Full report will be coming shortly. Ilene is an outstanding performer. … We recommend Ilene Evans most highly. We have recently returned from performing in Beijing, China as a result of working with Bronitsky and Associates. The experience was great for us all and we are confident that from what we learnt and the exposure will mean more tours and the chance to meet people from other countries and cultures. Gordon was detailed and prompt in providing us with all the information we needed to make the tour effective as well as fun and enjoyable. Bronitsky and Associates have demonstrated to us a respect and understanding that so often we as Native American performers do not get. At all times we were treated as professionals and expected to perform as professionals. Gordon was acknowledging of cultural issues that we must abide by and embraced us and our culture which has enabled us to take our place on the world stage. …for us at the TGSCCC, you will always be regarded as the game changer in the centre’s young life. I have since received a plethora of emails from individuals and groups that I never new existed before wanting to engage us on possible joint projects. 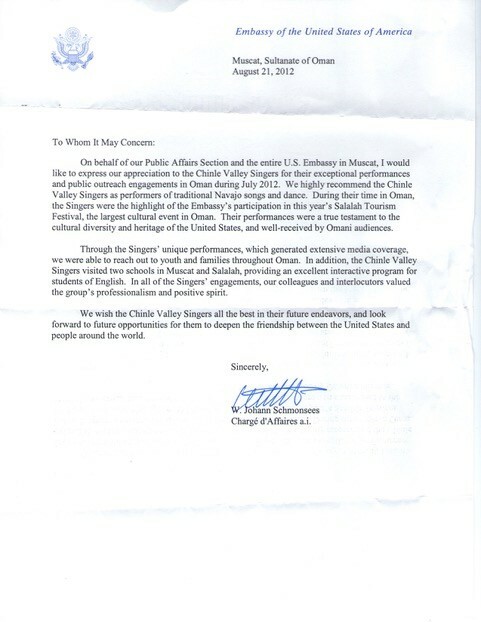 On behalf of our Public Affairs Section and the entire U.S. Embassy in Muscat, I would like to express our appreciation to the Chinle Valley Singers for their exceptional performances and public outreach engagements in Oman during July 2012. We highly recommend the Chinle Valley Singers as performers of traditional Navajo songs and dance. During their time in Oman, the Singers were the highlight of the Embassy’s participation in this year’s Salalah Tourism Festival, the largest cultural even in Oman. Their performances were a true testament to the cultural diversity and heritage of the United States, and well-received by Omani audiences. Through the Singers’ unique performances, which generated extensive media coverage, we were able to reach out to youth and families throughout Oman. In addition, the Chinle Valley Singers visited two schools in Muscat and Salalah, providing an excellent interactive program for students of English. In all of the Singers’ engagements, our colleagues and interlocutors valued the group’s professionalism and positive spirit. We wish the Chinle Valley Singers all the best in their future endeavors, and look forward to future opportunities for them to deepen the friendship between the United States and people around the world.